Eight high-ranking military lawyers from the Army Judge Advocate General’s office—which historically has ensured that interrogators do not violate prisoners’ rights—visit Scott Horton, head of the New York State Bar Association’s committee on international law, and ask him to persuade the Pentagon to reverse its policy on using “stress and duress” interrogation techniques (see Late 2002-April 2003) (see April 16, 2003). “They were quite blunt,” Horton will recall. “They were extremely concerned about how the political appointees were dealing with interrogation issues. They said this was a disaster waiting to happen and that they felt shut out” from the rules-drafting process. 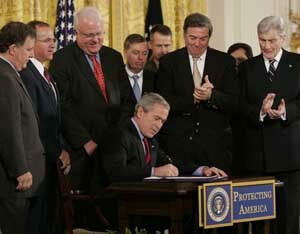 [Washington Post, 5/13/2004; Newsday, 5/15/2004; New Yorker, 5/24/2004] The lawyers describe the new interrogation rules as “frightening,” with the potential to “reverse 50 years of a proud tradition of compliance with the Geneva Conventions.” [USA Today, 5/13/2004] The military lawyers will make another visit to Horton’s office in October (see May 2003). Steven Bradbury. [Source: Mark Wilson / Getty Images]Steven Bradbury is nominated by President Bush to head the Justice Department’s Office of Legal Counsel (OLC). 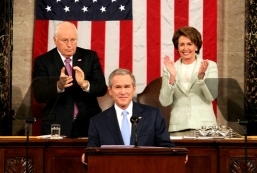 He will continue in that position on an acting basis into 2008, even though Congressional Democrats refuse to confirm him for the job, and even though his continuation in the post violates the Vacancies Reform Act, which precludes non-confirmed appointees for holding their positions for over 210 days (see October 16, 2007). [Washington Times, 9/20/2007; New York Times, 10/4/2007; TPM Muckraker, 10/19/2007] Bradbury takes over from Jack Goldsmith, who resigned the position under fire (see June 17, 2004). Zubaida was waterboarded. This is the first official on-the-record acknowledgment by any CIA official that the controversial technique that simulates drowning was used. Use of the CIA’s enhanced interrogation techniques is tightly controlled in the agency. Each application of a technique had to be specifically approved by the deputy director for operations. The CIA decides it will not prosecute former officer John Kiriakou, who recently admitted that the agency had waterboarded militant training camp facilitator Abu Zubaida (see December 10, 2007). [ABC News, 12/11/2007] One report, in the New York Times, suggests that “Kiriakou sought and received approval from the CIA” for the interviews. [New York Times, 12/11/2007] However, Kiriakou denies this and it appears not to be the case. [ABC News, 12/11/2007] Some accounts say a section of CIA officials are furious at him over the interviews. [ABC News, 12/11/2007; Harpers, 12/21/2007] However, according to Harper’s journalist Scott Horton, “Many high-level figures were elated to see the telegenic Kiriakou vigorously defend the agency on a subject on which it is already taking a lot of flak.” This is because efforts by CIA Director Michael Hayden and Director of National Intelligence Mike McConnell to fend off criticism from Congress and the public have “fallen flat.” One source will tell Horton: “Falling flat is putting it pretty generously. The public seems to have decided that they don’t really believe Hayden or McConnell on this issue. That’s bad news for us.” Horton adds: “Since the leaders of the intelligence community are under constant attack these days both from Democrats and Republicans, this can’t really be surprising. Kiriakou was, simply put, far more credible and appealing as a media figure.” [Harpers, 12/21/2007] Whatever the case, the CIA decides not to ask the Justice Department to investigate Kiriakou to determine whether he leaked classified information. Instead, CIA Director Michael Hayden issues a memo warning all employees “of the importance of protecting classified information,” although the memo does not mention Kiriakou by name. A spokesman adds, “Disclosing classified information is a violation of the law,” and “intelligence officers have a lifelong, moral and legal responsibility to safeguard classified information. This continues even after someone leaves the agency.” [ABC News, 12/11/2007] However, on this day Kiriakou reveals that the White House and Justice Department were involved in the waterboarding (see December 11, 2007), causing the CIA to change its mind and initiate an investigation of him (see December 20, 2007). Columnist and international law expert Scott Horton writes of his horror and shock at the nine just-released Bush administration memos from the Justice Department designed to grant President Bush extraordinary executive authority (see March 2, 2009). Timing of Repudiation Proves Bush Officials Found Claims Useful - Horton has no patience with the claims of former Office of Legal Counsel chief Steven Bradbury that the extraordinary powers Yoo attempted to grant Bush were not used very often (see January 15, 2009). “I don’t believe that for a second,” Horton notes, and notes Bradbury’s timing in repudiating the Yoo memos: five days before Bush left office. “Bradbury’s decision to wait to the very end before repealing it suggests that someone in the Bush hierarchy was keen on having it,” Horton asserts. Serving Multiple Purposes - The memos “clear[ly]” served numerous different purposes, Horton notes. They authorized, or provided legal justification for, the massive domestic surveillance programs launched by military agencies such as the Defense Intelligence Agency and the National Security Agency (see September 25, 2001). But the memos went much farther, Horton says: “[T]he language of the memos suggest that much more was afoot, including the deployment of military units and military police powers on American soil. These memos suggest that John Yoo found a way to treat the Posse Comitatus Act as suspended.” They also gave Bush the apparent legal grounds to order the torture of people held at secret overseas sites (see March 13, 2002), and to hold accused terrorist Jose Padilla without charge or due process, even though the administration had no evidence whatsoever of the crimes he had been alleged to commit (see June 8, 2002).